Reviews of the Sony Cyber-Shot DSC-T77 from around the web. 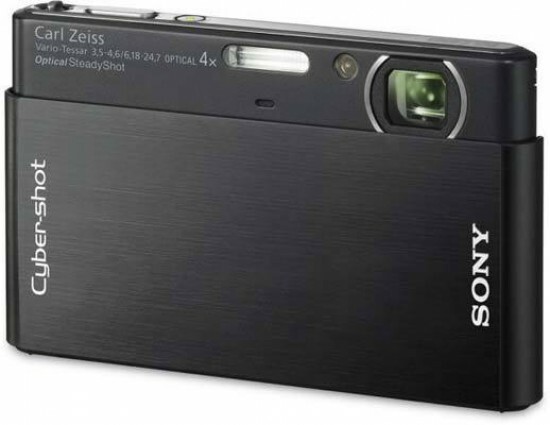 The Sony Cyber-shot DSC-T77 is an ultra-thin, stylish camera that offers an impressive feature set for the price. Those features include a 4X zoom lens, image stabilization, face and smile detection, a large touchscreen LCD display (though the interface is frustrating), and more. While it takes good photos outdoors, it doesn't perform terribly well in unusual or dim light, or at high sensitivities. Thus, if you'll be doing most of your shooting outside, then the DSC-T77 is worth a look. If you're not, then it may be worth considering another camera. Sony’s Cyber-shot DSC-T77 is a slim 10.1 Megapixel compact with a 4x optically-stabilised lens and a 3in touch-sensitive widescreen display. Announced in August 2008, it’s the successor to the Cyber-shot T70. Sony’s kept the display, sliding front panel and minimal physical controls, but increased the resolution by two Megapixels, extended the zoom range from 3x to 4x, enhanced a number of the automatic settings, and slimmed the unit down to a mere 15mm thick. The casual photographer will appreciate this slim camera for its fun touchscreen and vibrant color. It's easy to take along and fun to shoot with. You don't pay too dearly for the subcompact size, as images are of good quality, and Sony's image-enhancement features, like Dynamic Range Optimization, help improve your results in tough situations. And who can argue with stylish looks combined with practical design? It is a Sony after all. Like mobile phones, music players, PDAs and other modern high-tech gadgets, compact digital cameras tend to get slimmer and lighter with every passing year. Today I’m taking a look at the slimmest camera I’ve seen so far, the new Cyber-shot DSC-T77. At just 15mm thick and with a shooting weight of 151g it sets a new benchmark for ultra-compact cameras.